We used pacifiers for our children. It is an effective way to calm babies. I do not think that pacifiers interfere with breast feeding. Smart pacifier use can prevent thumb sucking. Like most adults, I detest seeing children over 3 years old with a pacifiers. 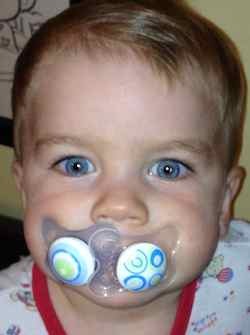 If your child can hold their paci like a cigarette or talk around it they are too old for a pacifier. I often see 2 and 3 year olds with overbites secondary to excessive or prolonged pacifier use. The Gordon Pacifier Program - During the first year, let your child have it all they want. ( I fear early removal of the pacifier may lead to thumb sucking) At 12 months old, the pacifier should be reserved for bedtime and stressful situations. After the child falls asleep the pacifier should be removed from their mouths. Between 18 and 24 months the pacifier should be permanently taken away. Our oldest son was probably our most pacifier addicted child. He slept with one in his mouth and one in each hand. At a year of age we struggled to wean his use. Finally, we tied his pacifier to a chair in the kitchen and told him he could have it all he wanted. It was great entertainment for my wife and I, as he would play for a while and then return to his pacifier to “gas up”. When we were ready to discontinue the pacifier, we would clip the end of the pacifier with scissors. It only takes a small clip for the child to notice and refuse. We would let the child know that the pacifier was broken. After 2 or 3 days, our children moved on and never had thumb sucking or other “oral” issues.